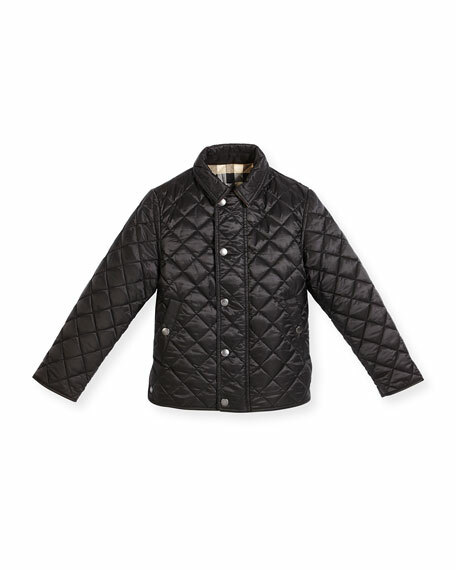 Quilted "Luke" jacket by Burberry. For in-store inquiries, use sku #1937720. 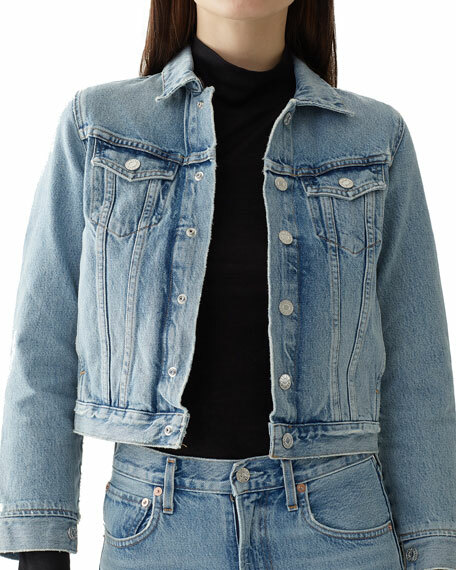 AGOLDE "Reputation" jacket in light-wash denim. Spread collar; snap front. Long sleeves. Side pockets. Chest flap pockets. Semi-fitted silhouette. Cropped hem. Cotton. Machine wash. Made in USA of imported material. 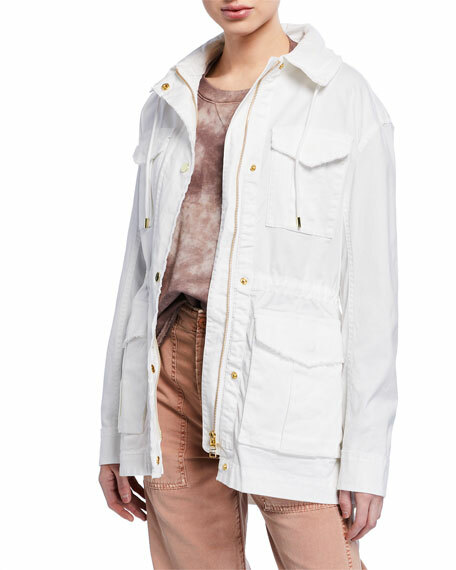 ATM Anthony Thomas Melillo field jacket with subtle fraying. Stowaway, drawstring hood. Zip front with snap cover placket. Long sleeves; button cuffs. Flap cargo pockets. Cinched waist. Back rainflap detail. Fishtail silhouette. Cotton/spandex. Machine wash. Imported. 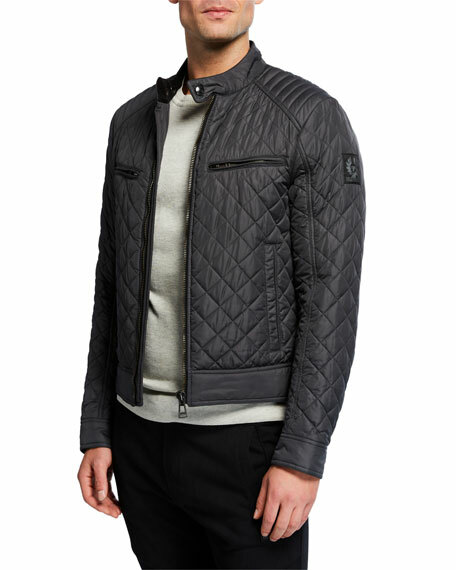 Belstaff "Vintage Beckford" racer jacket in quilted weave. Stand collar; zip front. Snap barrel cuffs. Chest zip pockets. Side slip pockets. Straight hem. Polyester body and padding. Cotton lining. Made in Romania. 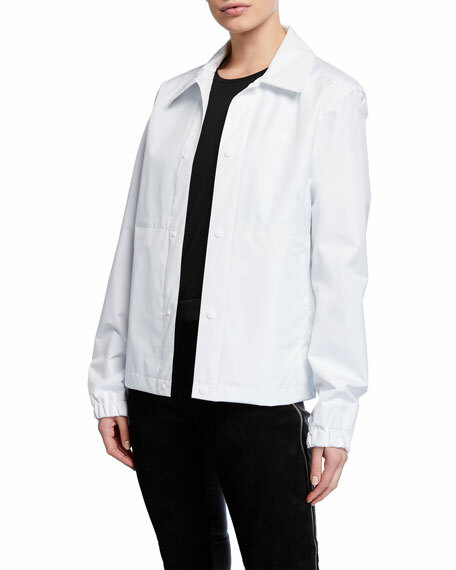 Helmut Lang "Stadium" jacket with tonal screen printed logo at front & back. Made from upcycled marine plastic waste. Interior backpack straps. Spread collar; snap front. Long sleeves. Side snap pockets. Relaxed fit. Polyester. Dry clean. Imported.